Animesh Bagdi 1 year, 11 months ago. Android Nougat 7.1 ROM, Galaxy Core Prime 3G Lineage 14.1 has now arrived via an UNOFFICIAL build. If you want some more Lineage ROMs or wanna taste the OFFICIAL Lineage build then stay tuned the Lineage OS 14.1 ROM collection page. Earlier we had the CM12.1 for Galaxy Core Prime. This Lineage 14.1 for Galaxy Core Prime 3G (core33g) is brought to you by developer Remilia Scarlet. If you like this ROM then consider a donation to Remilia15 (Remilia Scarlet). THIS IS AN INITIAL BUILD WHICH MAY NOT BOOT AT ALL. HAVE A BACKUP BEFORE FLASHING THIS AND TRY AT YOUR OWN RISK. Installing a custom ROM on a Galaxy Core Prime 3G (core33g) may require the bootloader to be unlocked on the Galaxy Core Prime 3G (core33g) phone, which may VOID your warranty and may delete all your data. Before proceeding further you may consider backup all data on the phone. You are the only person doing changes to your phone and I cannot be held responsible for the mistakes done by you. – Here is theTWRP update guide for the Galaxy Core Prime 3G (core33g). This TWRP recovery guide may require an unlocked bootloader on the Galaxy Core Prime 3G (core33g). If there is no in-built ROOT or it does not work for some reason then you can try flashing SuperSU zip using recovery. Download and Copy the GApps and Galaxy Core Prime 3G Lineage 14.1 ROM ZIP to your phone. First flash the Galaxy Core Prime 3G Lineage 14.1 ROM ZIP from device. Then flash the GApps zip from your device memory. Reboot and Enjoy the Nougat 7.1 Lineage 14.1 ROM for Galaxy Core Prime 3G (core33g). 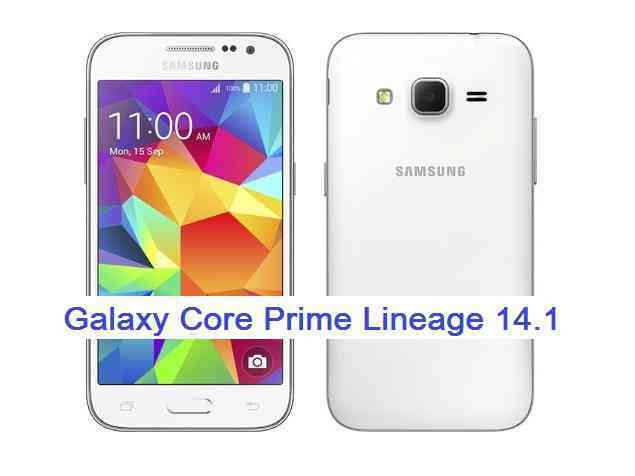 Copy the latest Galaxy Core Prime 3G Lineage 14.1 ROM ZIP file to your phone. Stay tuned or Subscribe to the Galaxy Core Prime 3G (core33g) forum For other Android Nougat ROMs, Lineage OS 14.1 ROMs, other ROMs and all other device specific topics. Do you mean GApps setup error or the setup error comes even without GApps? Anyway, the ROM download link is removed by the dev. Camera, flashlight, and ScreenRecorder not working otherwise Rom is fine I have tried it for 3days .. Great work keep it up . @animesh-bagdi If possible can you take time some time and help @ultimoorc_937 and others getting the ROM up and running for them?? Okk guys request accepted .. I will post a video tutorial on my youtube channel (search Animesh Bagdi on youtube) …and i will post link here too ..The problem is i dont have a good camera to record.. otherwise i already posted resurrection remix 5. tutorial ..